Pay as you go mobile broadband dongles are perfect for people who want broadband on the go without monthly bills. Buy a pay as you go dongle from £10 and add data for just £1 per day! Pay-as-you-go — also known as PAYG — mobile broadband gives you the same connection speed without the hassle of signing a lengthy contract. A Wi-Fi dongle is a device that plugs into a USB port on your computer. Through this, you'll have a wireless connection which you can use on the go, whether that be in a cafe, your local park or on your daily commute. For more information on mobile broadband dongles, check out our guide on what is a mobile broadband dongle. Compare all mobile broadband dongles. Pay-as-you-go mobile broadband is an excellent way of getting all the benefits of mobile internet access without being locked into a long-term contract. PAYG mobile broadband deals do exactly what they say on the tin: A pay-as-you-go dongle allows you to have a high-speed internet connection on a prepaid basis. With PAYG mobile broadband, you don't have to worry about bills and monthly usage allowances as with PAYG you only ever pay for what you want to use. How does pay-as-you-go mobile broadband work? Pay-as you-go mobile broadband works in much the same way as any other PAYG deal. 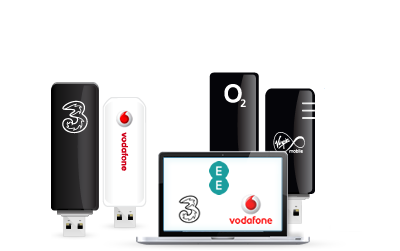 You choose from a range of mobile broadband networks offering PAYG mobile broadband deals, then purchase a pay-as-you-go mobile broadband dongle. Once you have your mobile broadband dongle, you can prepay for your mobile Internet usage. Just like you top up your PAYG phone with minutes, you top up a PAYG mobile broadband SIM with gigabytes of data. Looking for fast mobile broadband? Compare all fast mobile broadband deals. Pay-as-you go mobile broadband is an ideal mobile internet solution for a whole range of people. It can be a great way to supplement your home broadband package to afford you ultimate freedom and connectivity with your laptop and other portable devices. If you already pay a monthly subscription fee for broadband and are reluctant to get tied into any more contracts, then PAYG mobile broadband is a great way to get all the benefits of mobile broadband without any long-term commitments. Looking to save money on your mobile broadband? Compare cheap mobile broadband deals. PAYG mobile broadband is also great if you are a student looking to study away from home, on the train or even in the park. With pay-as-you-go mobile broadband, you're free to take your laptop and study wherever you go. And you can keep tabs on how much you're spending without the fear of a huge bill landing on your doorstep at the end of the month. If you want to give mobile broadband as a gift then PAYG mobile broadband is great: You can get the pay-as-you-go mobile broadband dongle, load it up with credit and it's ready to give to your nearest and dearest! Not what you're looking for? Compare contract mobile broadband deals including dongles, MiFi units and laptops with built-in broadband capabilities on our mobile broadband site.